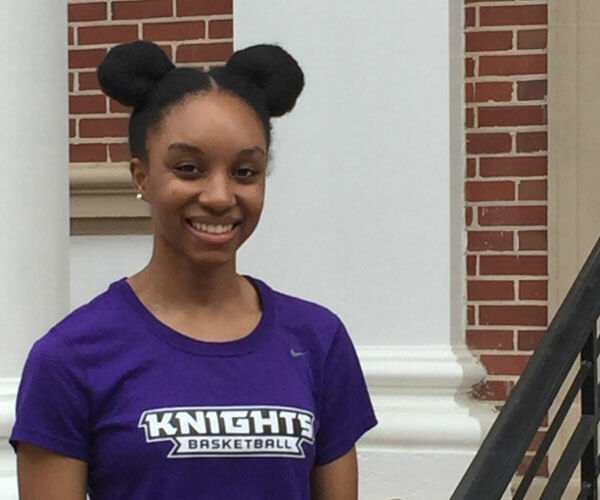 Business major Kianna Delas, who moved to Georgia from Canada to play guard for the Knights women's basketball team, is aiming for a career in the corporate world. Full Name: Kianna Delas. Age: 20. High School: Andrews Osborne Academy, where she played on the varsity women's basketball team, served as an Andrews Osborne Academy school ambassador, assistant coached the middle school girls' basketball team and was part of an outreach/ volunteer program called Make A Swish. Family: Annette and Willie Delas. Degree Objective: Bachelor of Science in Business Administration. Activities: "I play guard on the Knights women’s basketball team." Career Goals: "I would like to use my business degree to become a fashion merchandiser, an individual who promotes and sells apparel to potential customers and designers. For as long as I can remember, I have been fascinated by the different cultures incorporated in clothing to make unique styles, as well as the creativity displayed when people pair different fabrics and prints together." She chose Middle Georgia State University because … "It was a good fit for me academically and athletically. I always wanted to go to school away from home in a warm climate." The greatest thing she discovered about Middle Georgia State was … "The secure, safe, and friendly atmosphere I felt on campus." Her greatest academic experience as a Middle Georgia State student has been … "Lou Bell's World Lit class. The class itself captivated me, but with Ms. Bell as my instructor my critical thinking skills were challenged by the way she delivered the content of the course. I felt I grew as a person after having gained so much knowledge from the class." To her, "greatness” is … "When an individual unlocks their full potential and in doing so achieves excellence." In five years … "I plan to be working on my master's degree and interning at companies to learn fashion merchandising. My long-term goals are to become the fashion merchandiser of a large company, help my family, and give back to the community."